Whenever i make these i am transported back to the Greek island of Tinos which is renowned for its wonderful sundried tomatoes. Kefalotiri and kefalograviera are hard, Greek cheeses made from sheep or goat’s milk and both are excellent melting cheeses. Prepare these filo pies ahead of time and store in the fridge. Cook just before serving. 125ml (½ cup) extra-virgin olive oil for brushingPre-heat oven to 160˚C. Place all the ingredients except for the filo pastry and olive oil in a bowl, season to taste and mix until well combined. On a clean bench top, place a sheet of filo and brush with olive oil. Repeat with a second sheet of filo and oil (cover remaining filo with a tea towel to prevent it from drying out). Place 2 tablespoons of the filling along one short edge of the pastry. Fold the two sides in towards the centre to cover the filling, then roll pastry down to the other end to form a small log. 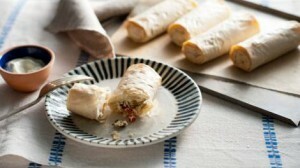 Repeat this process with remaining filo pastry and filling until you have 20 rolls. Arrange the rolls on two baking paper lined oven trays. Brush each roll again with olive oil and bake in the oven for 25-30 minutes or until golden and crisp.